In 1917, New York spitballer Fred Anderson led the National League in ERA (1.44) and WHIP (0.93), great numbers even for the Dead Ball Era. What's more amazing under the circumstances is that those numbers earned him just an 8-8 record, despite the Giants winning 98 times as a team and taking home the pennant. Five other Giant pitchers reached double-digits in 1917 and "ace" Ferdie Schupp won 21, so how did Fred fare so poorly in comparison? First, he was already a 31 year-old journeyman, so not likely to compete for a regular turn in New York's strong rotation. 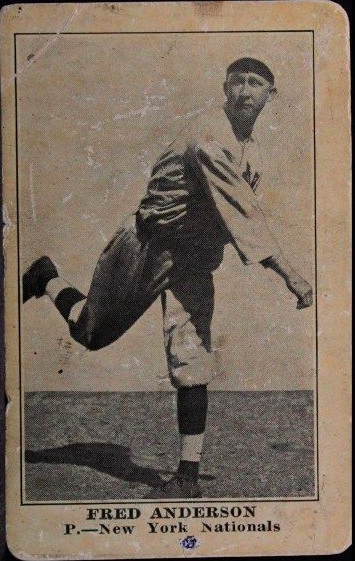 It's also possible Anderson showed nerves in relief situations that gave HOF manager John McGraw pause when considering who to start every four days; I won't be the guy to label McGraw as a "poor evaluator of skills." 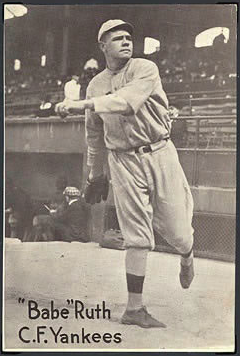 1917 ERA champ Fred Anderson fell back to league-average in 1918, enlisted for WWI duty, and retired to his dental practice following the war. SABR's bio covers his postwar life in more detail, just one example of their breadth of ballplayer research. That "Boston Store" (a midwestern department store chain) got its name on the back of Fred Anderson's baseball card says more about the growth of baseball marketing than any particular effort on their part. It's one of multiple advertisers that used this 200-player, 1917 set to attract customers, likely by arrangement with Chicago printer Felix Mendelsohn. A family department store ad targeting boys via baseball does reflect the growing success of marketing through children, not a common strategy prior to the 20th century. Felix Mendelsohn's company debuted this basic design in 1916 via The Sporting News, itself a two-stage release that vintage collectors know as M101-4 and M101-5. Read the PSA profile for lots more about its variations, then see Old Cardboard's comprehensive checklist and gallery of advertiser backs. 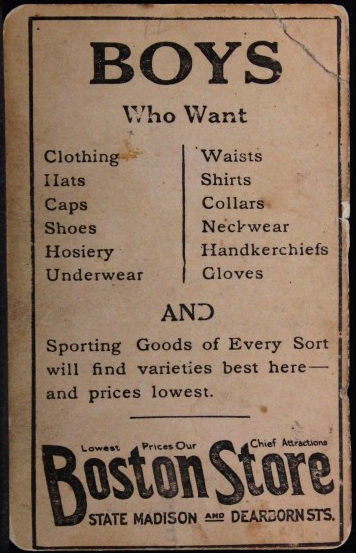 The complete 1917 Boston Store checklist includes several variations, for a 210-card master set. By 1917, Boston Stores served several Midwestern metro areas; reader Mark Aubrey ID'd the stated "State, Madison, and Dearborn" as streets bordering their block-sized store in Chicago. 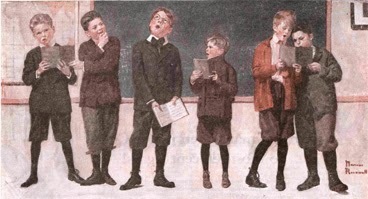 If you're wondering what the "boys hosiery" mentioned on card backs looked like, think knickers and knee-socks. Mendelsohn printed sets from 1915 to at least 1920, and they include Babe Ruth's RC, Jim Thorpe's only MLB card, and a handful of Joe Jacksons. A rare, postcard-sized M101-6 release also contains the Babe's first professed Yankees card, issued just after his 1919 sale from Boston to NY. If this era's style of card promotion had succeeded, collectors might consider Felix Mendelsohn on par with 1950s Topps for innovation. As it was, he gave early fans lots to enjoy in the WWI era and modern collectors plenty to hunt for today. Value: My Boston Store type card cost $70 on eBay. Other Boston Store singles go for less, so you can find a better deal if you're not particular about the player or team. Fakes / reprints: Fakes and full-set reprints exist for The Sporting News sets, so might also exist for this Boston Store set. The aforementioned PSA article includes a section on what to look for on known counterfeits. State, Madison, and Dearborn streets are also in Chicago. They border three sides of a block, with Madison on the south, State on the east, and Dearborn on the west. "Before Charles [Netcher] died in 1904, the Boston Store expanded rapidly and soon occupied almost the entire half-block on the north side of Madison between State and Dearborn." Ah, so Chicago it is! I'll update the post.